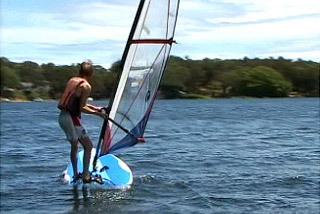 Water Sports - All Levels, All Abilities! 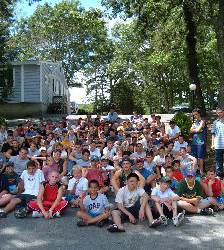 What’s Camp Bournedale Summer Camp all about? 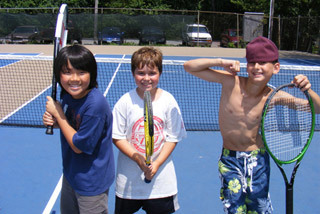 Camp Bournedale summer camp is beginning its 80th season of operation. Founded by Mr. and Mrs. Samuel Gerson, it is a family business now proudly owned and operated by their son, Arnie, who carries on the strong tradition of Bournedale. 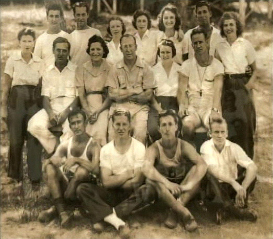 Director Arnie Gerson is a second-generation owner and a product of Camp Bournedale. A guidance counselor for 17 years and former athlete in high school and at Tufts University, Arnie retains his love for sports and his interest in learning. Mr. Gerson received his Masters in Guidance from Harvard University in the MED program and has extensive experience working with youngsters. All these factors combine to provide a great camping experience for each participant. Bournedale’s excellent and caring reputation is reinforced with the passing of each wonderful season. 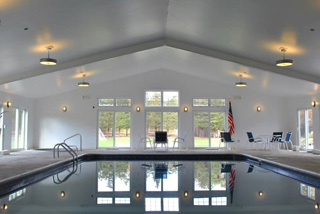 Accommodating just 140 campers, Bournedale is located on beautiful Great Herring Pond in Plymouth, Massachusetts. Camp Bournedale, boys summer camp, is known for it’s superb athletic facilities and instruction in a wide variety of areas. It boasts seven tennis courts, two ball fields, and two outdoor basketball courts, all lighted for night play. Many of our competitive programs are held in the evening, making the day available for our other active programs. Outstanding training clinics are held in tennis, golf, soccer, and basketball. 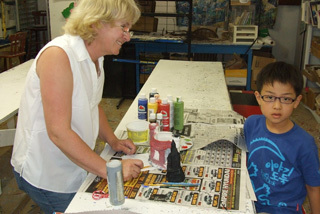 In each area, we give the kind of excellent instruction our campers really enjoy. 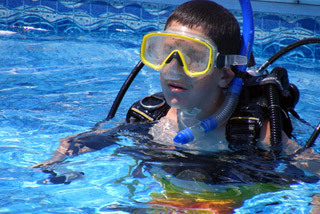 Camp Bournedale, summer camp has superb facilities and each counselor is prepared to give high quality instruction to the campers, who range in age from 6 to 16. Each beautifully finished cabin, houses seven to eight campers, a counselor and a counselor-in-training. All cabins are heated and have restrooms and showers. Food serving is done family-style with cabin members eating as a group with their counselors. A sumptuous salad bar and cold cut station has added a wonderful dimension to our food service. 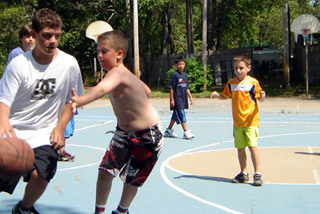 The daily program at Camp Bournedale, summer camp, is a structured one. 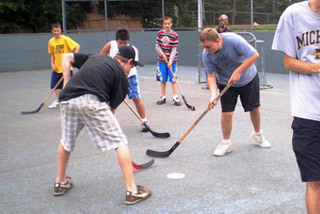 In their first years at camp, we try to expose the campers to all our activities. 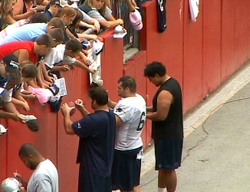 Once the campers have sampled all that camp has to offer they get to choose their daily schedule. There is ample free play built into the program, so that it flows and is not rigid. Each evening is specially planned. 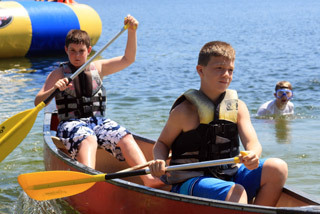 The friendships that develop make summer at Camp Bournedale a “special place.” Campers are grouped according to age, grade, maturity, and friendship. 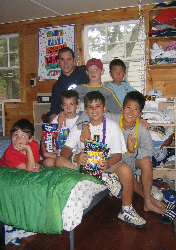 It is not unusual for a camper to go through his camping career with the same bunkmates and often the same counselor. Many of these relationships remain life-long. A large portion of our staff, are former campers who are now college students. They bring enthusiasm and loyalty to camp – so important to a successful season. 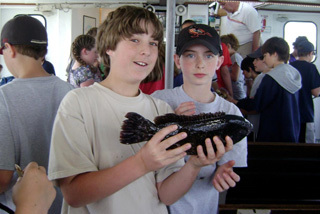 We have a very active Counselor-In-Training program that begins when a camper reaches age sixteen. Continuity of staff is one of the strengths of Camp Bournedale, boys summer camp. In addition to being a source of support and guidance during the summer, counselors often keep in touch with the campers during the off-season. View Our Photo Gallery. Camp Bournedale has a registered nurse residing in a well-equipped infirmary on the grounds. Pediatric Associates, a group of five excellent pediatricians in Plymouth, is used for medical expertise. All campers must be examined by a physician prior to camp, and submit a medical history. Upon arrival at camp, all campers have another physical exam by our nurses. The nurses work closely with the camper’s family doctors when necessary. Campers good health and well being is of paramount importance. Good child care is a cooperative effort. 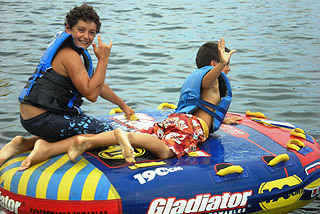 The communication between family and camp are essential in a safe, fun and rewarding experience for each camper. All staff are first aid and CPR certified with numerous staff certified as Red Cross Lifeguards. Here at camp we divide the campers up into the four different age groups; Freshman, Sophomore, Junior and Senior. It is within these divisions that the camper will be placed in cabins and also into their classes/programs. Check out the example daily schedule below. 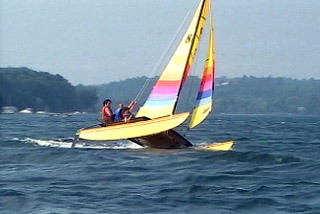 For each camper, two of the 4 classes are mandatory. One is swim and the other is athletics. Free time is time to go play any offered team sports up on the ball fields or on the courts. Competition games are often held at these times. 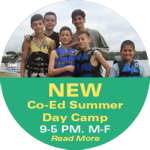 The evening activity may be on or off campus depending on the night, and back to cabin times depend on camper age. Our older campers have the opportunity after the evening program to use our lighted facilities, two indoor gymnasiums and weight room. 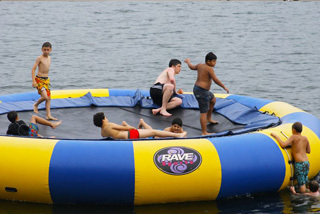 Swim class takes place up in the pool or out on the swim dock on the lake. 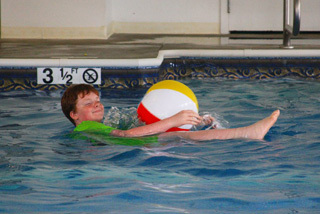 Each camper will attain an American Red Cross swim certification levels by the end of camp. View Our Photo Gallery. The compulsory classes are often the most fun and most fulfilling. Both our highly trained swim and athletics directors maintain the campers balance of fun and effort in each of their respective classes. 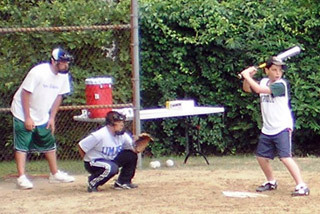 Athletics take place on our multiple ball fields (which are lighted for night play). 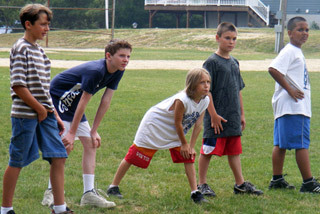 Activities can range from structured team games like baseball and soccer. Excellent instruction is provided on our tennis courts. 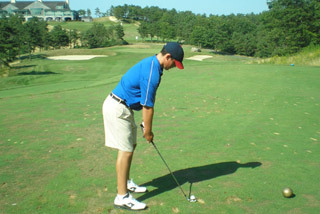 We also provide classic golf instruction from our resident golf instructor. We play daily at the local courses and often have our own golf tournaments. 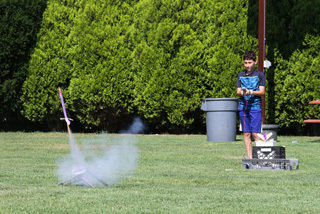 We also run an exciting rocketry program in addition to our popular arts and crafts classes. 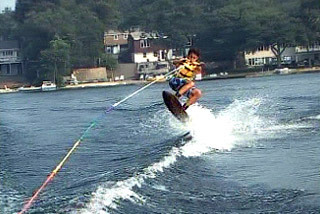 Great Herring Pond allows us to offer numerous water sport options. The fully trained waterfront staff consists of lifeguards, power boat drivers, sailors and swim instructors who will ensure a safe and fun environment for everyone on and off the lake. 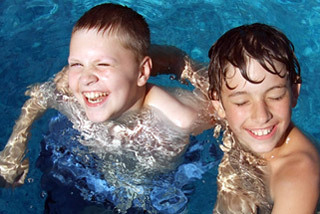 Check out the different boys camp water sport options. The 3 day trips have been to Martha’s Vineyard, the lower Cape, of Cape Cod, Newport, RI, and as faraway as Springfield for White Water Rafting. These camping trips are exciting breaks from the regular schedule that campers sign up for quicker than you can say “Camp Bournedale, boys summer camp!”. Camp Bournedale, summer camp for boys, is convenient to the Boston area and Logan Airport, which is less than an hour’s drive. Arrangements are made for out-of-town campers to fly to Logan, where they are met by Camp Bournedale personnel. Each camper’s family is contacted to report his safe trip and arrival.